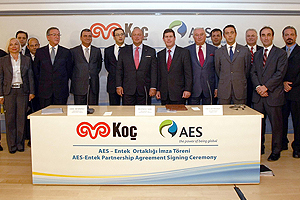 US power producer AES Corporation has entered into an agreement with Koc Holding to form a joint venture to develop and operate power generation projects in Turkey. Under the deal, AES will buy almost 50% interest in Turkish utility Entek Elektrik Uretimi from Koc unit Aygaz. Entek has 300MW of natural gas facilities in Turkey, and AES-Entek JV will diversify into other energy sources such as coal, hydropower, wind, as well as natural gas by pursuing greenfield projects, acquisitions, and other opportunities through Turkey's plan to privatize 15GW of generation assets. AES president and CEO Paul Hanrahan said that AES sees enormous opportunity to develop and modernize electricity generation projects in Turkish market that will deliver a compelling return on investment.